Financial indicator establishing the ratio between the amount of losses reported (and not only those that have been indemnified by the insurer) and the amount of premiums collected. The insurance premiums are the amount paid by the insured monthly or annually to benefit in the event of a claim from the guarantees in the insurance policy. It is an expense towards the preservation, maintenance and administration of the immovable. Although the syndicate assumes this cost, it is charged back to the co-owners as a portion of their common expenses (condo fees). The additional premium is a premium that is added to the existing premium. It results from a worsening of the risk or from the assumption of a new risk. This additional premium may be imposed during the course of a contract or upon its renewal. Risks are analyzed according to scales that are specific to each insurer. Ultimately, the syndicate will pay this additional premium, which will be charged to all of the co-owners through the common expenses (condo fees) or, at times, some of them. 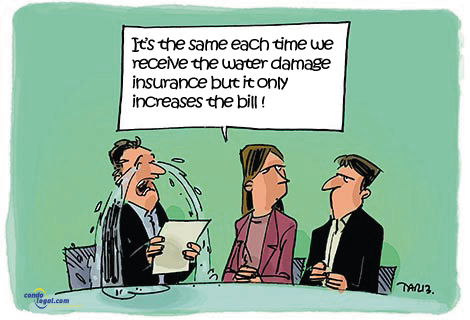 Water damage is the leading cause of loss in co-ownership. 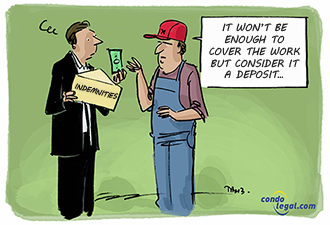 It is more and more costly, for syndicates and their insurers. 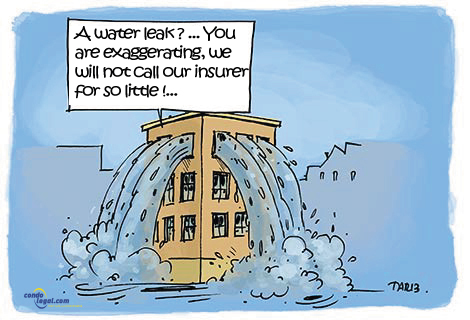 In the last ten years, occurrences of water damages have more than doubled. Lack of maintenance, sub-standard construction and climate changes are the main culprits. In most cases water damage affects equally common and private portions, thus it is one of the most complex loss to adjust.